would it have a negative effect on the 3d mesh model if I capture photos to the same region in different flight attitude but with the same GSD. Given the DJI could adjust the GSD to keep identical while changing the flight altitude. It is true that in the Pix4D capture you can define the GSD by manipulating the height parameter which will "tell" the drone how it should fly. When you will fly on two different heights, and you want to have the same GSD - the focal length has to change. When the focal length varies the software should recognise this change and detect two different camera models after uploading all the images together. This is important because the camera will have different internal parameters during those two flights and the software has to be "informed" how the area was exactly flown to calculate the accuracy correctly. Taking this into account please ensure the software detected two cameras. If this is not the case, you should process those two datasets separately as subprojects and merge them afterwards. 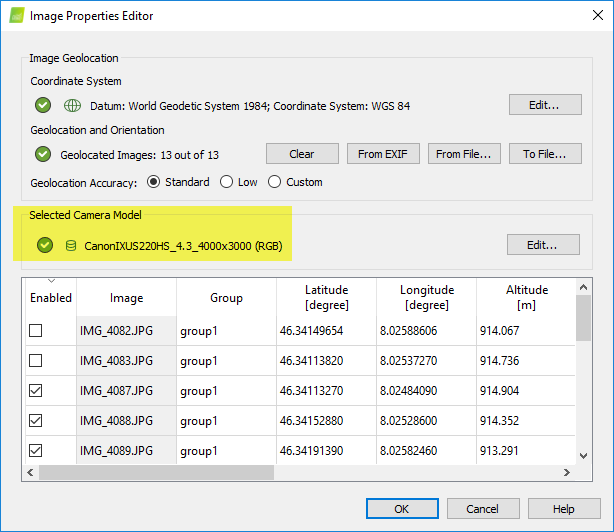 Note: As for now, in Pix4Dcapture the feature terrain awareness is not available. Therefore only if the area will be flat, the GSD will be the same as it was set.